Grow Broccoli in Container - How to Do the Right Way? We all know how nutritious broccoli is. But apart from the fact that it’s healthy for our body, it is also an important ingredient in most food dishes. This is the reason why we need them. For sure, we can get them at our local grocery or department store. But what usually happens is that these are sold expensively. And the price is also subject to change and even become more expensive. So what’s the best thing to do about it? Well, the answer to that is to grow broccoli in a container at the comforts of your own home. In this article, we’re just going to teach you with that. The first thing you need to prepare is a container, of course. Its ideal size is around three gallons. This would be more than enough for your broccoli to grow. Though you might find it a bit big, it really isn’t because it needs to have enough space for it to grow and expand. The kind of potting soil you need to use is one which is high in nutrition. A broccoli plant needs a lot of nutrition for it to have its green pigmentation. Its stem and small leaves also need it to spread properly. You can add natural compost on the potting soil to make it more nutritious. Frankly speaking, you don’t really need a fertilizer if you’re using a premium potting soil. But if it happens that you have a standard soil then better get one. This assures that your broccoli plant will grow properly and be healthier. It also reduces the chances of it getting pest infestations. It also needs sunlight. Make sure that the place where you’re going to put your broccoli in can be reached by direct sunlight. Sunlight is what gives it Vitamin D so that it can have nutritious elements within it. However, it shouldn’t receive too much sunlight because it will just wither them. ideally, you can expose your broccoli plant to sunlight for 8 hours each day. The last but certainly not the least preparation you need to do is to make sure that it gets the right temperature. A broccoli plant won’t have any harvestable produce if it’s placed in a temperature that goes well beyond 75 degrees Fahrenheit. This is why you need to make sure that the place where it’s placed is cool. The first thing you need to do is to make sure that the temperature where you’ll be germinating your seeds is around 24 degrees Celsius. This is the ideal temperature where you can assure yourself that they’ll grow properly. Once you’ve picked a place, put the broccoli seedlings on a seed tray. A soilless potting mix will do as this is one of the best places for seed germination. Then sow it half an inch deep. You can also sprinkle it on the potting mix. When you’re doing it, cover the seedlings with a thin layer of soil mix. Water it and make sure to keep the soil moist and wet. Place the tray outside so that it can receive direct sunlight. It’s through this that the seed germination process will start. You’ll wait around two weeks for the seedlings to germinate. During this time, it’s best if you transfer it to a shadier location every noon time so that it wouldn’t be too heated up. Make it a habit to sprinkle water on it at different time intervals in the day. When they start to grow, you can then ready the container where they’ll be placed. It’s best if the container has a diameter of around 12 inches. 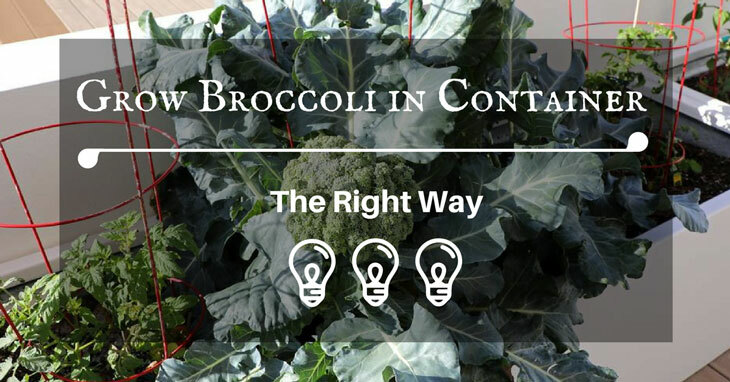 If you want to grow a lot of broccoli plants, it's best if you use a larger container. And remember, they shouldn't be too tightly packed with one another. They shouldn't be too close to the edge too so that they'll have enough room to grow. Put holes in the container as this will serve as the drainage for the plant. You can put the holes on the bottom portion or on the sides. It’s best if the container is 10 inches deep as this will be large enough to accommodate the broccoli plant’s root growth. Now, it's time for you to transplant the seedlings. The perfect time to transplant them is when they're already a few inches tall. This will be around 5 to 6 weeks after planting them. To transplant it, first, loosen up the soil. When it's already loosened up, gently tug the leaves out. You want to further loosen it up. But do it in a very soft manner so you won't damage the seedlings. Then slowly lift the seedlings out together with its roots. Transfer the recently pulled out young plant to another container that has the same depth and dimensions. But don’t immediately put it outside because you first want to harden up the seedlings before exposing it to direct sunlight. They’re still too fragile at this moment. When you feel that they can now take up a lot of heat, that’s the time to place them outside. Now that you’ve already done the planting process, it’s time for you to do the fertilization. It’s by fertilizing it that you make sure that you avoid pests and fungal infections on your broccoli plant. Apply general purpose fertilize on it once a month as this helps its growth process. Don’t use high nitrogen fertilizers because these are usually too strong, and doesn’t do any good to broccoli seedlings in the long run. You can even use natural compost to further enrich it with nutrients. This strengthens their steams and makes them greener. Water is a vital need for all plants, and broccolis are surely not exempt from this fact. Make it a habit to water them every day. It's ideal to water them before sunrise, at noon, and after sunset. Watering them before the sun shines is important because it needs moisture to prepare it for the upcoming heat. Water it at noon comes as to no surprise because it obviously needs water to keep up with the heat, knowing that noontime is the hottest time of the day. Then there's the after sunset watering which is beneficial because it ensures that its damaged cells will regenerate back overnight. Growing broccoli is not really that hard. As long as you know what to do, have the things needed prepared, and gets the right guidance, then there’s no doubt that you’re going to grow lots of broccoli in your backyard. By simply remembering what we have to say in this article, and applying them in real life, you can do just that. It's not rocket science to grow broccoli in containers. It's just a matter of having the right materials, environment, and the passion to do so. Hopefully, this has helped you in growing broccoli the right way. If you find this article helpful, feel free to share this with your family, friends, and other people you know who are interested in planting. Not only does this make them a better gardener, but this will also make them healthier in the process.